Above: A terrace of houses in Conduit Mews, a side turning off the south side of Praed Street, in Paddington. 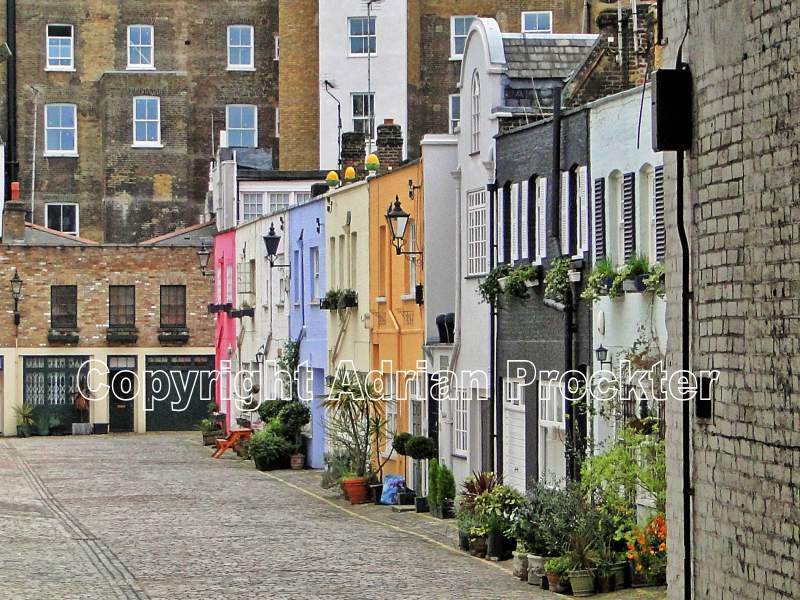 This colourful terrace is ‘tucked away’ within a stone’s throw of Paddington Station. Terraces like this one are common across London and they were originally the stables and coach-houses for large houses in which the stable-boys and other staff once lived. Although many examples of these buildings are in evidence in London, they are less evident in Paddington for a simple reason – it was not where many of the upper classes chose to live. Belgravia and Chelsea are more likely areas in which to find a mews terrace, tucked out of sight of the more impressive houses owned by the wealthy, with their grand frontages on the street. The picture is interesting enough but there is another reason for including it. It concerns the name – Conduit Mews. If there is one thing to look out for in London, it is an unusual street name. This one is a good example example. The City of London was well-supplied with water in medieval times. It was situated beside the Thames and the smaller River Walbrook flowed through the middle with the River Fleet flowing through the western part. However, as time went by, all these sources of water became polluted in one way or another and the authorities decided that new sources of fresh water should be sought. We are talking about the 14th and 15th centuries in this case and piping water over long distances was very difficult. Pipes could be made of lead but the cost of such a pipe extending over miles was far too expensive. The alternative was wooden pipes. Because they conducted the water through them, they were known by the Latin name ‘conduit’ – meaning ‘to lead’ which in this case was the water. Tree trunks were cut down and a large and very long hand auger was used to bore a hole through the whole trunk. If you think of a tree trunk being represented by a pencil, then the black lead in the middle would represent the hole through the trunk. One end of the tree trunk was cut in the form of a point (rather like a pencil point) and the opposite end was cut in the form of a funnel. Many tree trunks were required to carry water over a mile of land and each tree trunk was inserted into the next one to form a long ‘pipe’. Much of the water probably leaked out of the poorly-made joints – modern day sealants did not then exist. One source for water for the City of London was a spring near the village of Paddington. Inspection of a street map will reveal a ’Spring Street’ a short distance from Conduit Mews’. In fact it is just around the corner. From the springs at Paddington the water was conveyed by conduit across the fields, eventually supplying water in Fleet Street. In fact the pipe was known as the conduit but, because the end of the supply was a small stone or wooden structure, where the tap was mounted. That structure also became known as ‘the conduit’. The Fleet Street Conduit actually stood in the roadway in Fleet Street. The whole water supply process worked on gravity. It was necessary to find a spring that was physically higher than where the end of the conduit was situated. The water therefore entered the conduit at Paddington (in this case) and fell gradually towards the tap at the end (in this case in Fleet Street). Several conduits were built to supply the City with fresh water. It was built in 1471 with money left for the purpose in the will of William Eastfield, Mercer and Lord Mayor. Water was brought from Tyburn and Highbury Barn to the Fleet Street Conduit. Stow refers to it as both ‘conduit’ and ‘standard’. It stood near the south end of Shoe Lane in Fleet Street, and was also called ‘Shoe Lane Conduit’. In 1478 a cistern was added to hold water. In 1553 the conduit even ran with wine in celebration of Anne Boleyn being crowned Queen at Westminster Abbey. In 1582 it is known that the cistern was enlarged. The whole structure was damaged in the Great Fire (1666) and after that it was not rebuilt. London’s history is often in the form of one giant tangle of linked places and facts. As has been shown in this article, we started with an interesting view which was associated with an unusual name for a side street in Paddington, now in the City of Westminster. That has resulted into links to water supplies that ended in Fleet Street, in the City of London. This entry was posted in /Wes-Paddington. Bookmark the permalink.